We will be streaming this Live so tune in.. The David Kamatoy Radio Show airs today beginning at 4:00 pm PST with guests Chris Eader of No More Geysers, David Barnes of 10 Dollar Home Deals, Mark Christopher Lawrence of NBC's Chuck, and a Geek Round Table. 4:00 pm PST: Today David Kamatoy will be checking in with entrepreneur Chris Eader, co-founder of No More Geysers. The No More Geysers Riser is an auto shut-off device for broken sprinkler heads. Chris will be discussing the updates on the company as the product is just becoming available in retail stores. Following Chris Eader, David Barnes of http://10dollarhomedeals.com/ discusses how he is making lemonade out of lemons after being involved in several real estate deals that went sour. We will also discuss a recent postive story that got national attention on CNN that actually has a darker side directly connected to the impetus of 10DollarHomeDeals.com. 5:00 pm PST: In the second hour of the program star of NBC's "Chuck" Mark Christopher Lawrence joins the show to give us a preview of his appearance at the San Diego Comic-Con on Saturday. Chuck is about to start shooting the third season of the show in just a few weeks. In the interim, Mark Christopher Lawrence has been doing stand-up comedy and performing in theatre most recently San Diego Black Ensemble Theatre production of Gangsters. At 7:30 pm PST the show will start a live stream covering the San Diego Comic-Con where a Geek Round Table will be happening at 7:30-8:30 pm PST led by the founder of http://geekroundtable.com/, Ned Cato Jr. "Geeks talking about Geeks in front of Geeks...Perfect" says, Ned Cato Jr.
Ths summer movie season is well upon us, and we're here to recap the best and the worst geek-centric films that have come out thus far, and we're doing it in proper GeekRoundTable style (otherwise known as lots of geeky debating)! Here's a link to that Onion Star Trek video Chris mentions. Here's the original post on Geek-tastic about the Girls Guide to Comic Con. Here's a direct link to the LA Times Article entitled The Girl's Guide to Comic Con. Ok, so we know it's been a long time since we last posted an episode of the podcast up for you to listen to and to love. We're sorry about that. Sometimes in life, since we're not fortunate enough to be full time bloggers or podcasters, the real world steps in and prevents us from doing that which we love . . . namely entertaing you and talking about nerdy stuff. It's been a busy couple of months for everyone on the GeekRoundTable and getting everyone's schedules to sync up together to make recording a show possible isn't always easy. But a new we do have nonetheless. Well . . . New-ish anyways. This episode of the podcast was recorded back in April, so some of the references may be a little out of date, but that's ok. The show is still as entertaining as hell, especially when Matt and Wes start doing Terrence and Philip impersonations. Oh, and this is the Zombie Web Comic that people discuss. And this is the Watchmen Condom Chris refers to in the episode. No, he didn't make it up. It's real. For those of you who have never podcasted before, let me tell you it's not as easy as it looks (or sounds, as the case may be). Getting a large group of people all online at the same time to record a podcast over Skype is not an easy task. And then, once you have everyone online it takes a bit to make sure everyone's equipment is working properly before you can begin officially recording. During that period while some people are still setting up, the rest of us are left to pass the time by randomly talking amongst ourselves and keeping ourselves entertained until we're all ready to go. That's how this little bit of audio came to be. This was recorded right before we started officially recording our Best of 2008 Episode. Chris was having some problems with his headset, and while we were trying to figure out what was going wrong, Mary makes a comment to which Johann responded with a good joke and from that point on the rest of us just ran with it. In the process, we ended up creating an idea for the greatest horror film of all time. If you'd like to find out what it is, just listen to the clip. It's only about 4 minutes long, but we all find it highly entertaining. Hopefully, you will too. At the very least, with this clip you can catch a peek at what goes on behind the scenes here at the GeekRoundTable. Hey there folks. I know it's been a long time indeed since we've had some new podcasty goodness for you to listen to. Well never fear, for the Geeks are back baby! That's right, the first part of the long awaited Best of 2008 episode is finally available. We apologize sincerely for the delay, but due to certain issues with the recording, this part of the episode had to be re-recorded and edited. Then there was that whole Wonder Con thing going on last week that's kept everyone busy. So now, here we are. I'm happy to report that this episode of the podcast sees a return to decent sound quality for the show. This time around we experimented with Skype-casting the show. The results aren't quite perfect yet, but the audio is much improved over our last episode or two. We'll continue to work out the kinks as we go. In this part of the podcast, our fearless leader Ned Cato Jr. leads a panel that includes Chris, Mary, Johann and myself (Patrick) as we go over some of our favorite geeky things from last year. We look at the best TV shows, movies, videogames, geek moments and more from the year that was 2008. And in a year that brought us such amazing things as the Dark Knight, you know it's going to be a good show. 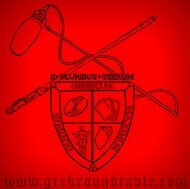 So sit back, relax, and kick it with the grooviest geeks you've ever listened to on the internets.....the GeekRoundTable! DISCLAIMER: Once again technical problems have beset the show. I promise to keep these problems to a minimum in 2009. Hello there true believers, and welcome back to another wonderful episode of the GeekRoundTable. This time around it's our Holiday Special. In this half of the episode we go over our list of favorite holiday films, we discuss the return of Todd McFarlane to Spawn, McFarlane's love of capes and we poke a lot of fun at Rob Liefeld. Here's a breakdown of our favorite holiday films (in alphabetical order). If you'd like to know who chose which films, well, you'll just have to listen. There are also two special mentions that aren't on the official list, but which deserve some recognition. They are The Hebrew Hammer and Foster's Home For Imaginary Friends' Christmas Special. Just who is that in the photo? You'll have to listen to the podcast to find out. Hey there true believers! We're back with a very special edition episode of the GeekRoundTable. In honor of Will Eisner's comic book character The Spirit finally getting his moment on the big screen this Christmas, we bring to you an episode dedicated to the man himself...Mr. Will Eisner. In this episode, regular GRT members Ned Cato Jr. and Chris Sturhann are joined by two very special guests...Batton Lash and Jackie Estrada. Batton Lash is a comic writer and artist. His wrote and drew the series Supernatural Law and has written for Bongo Comics' Radioactive Man series. He also owns a comic company is called Exhibit A Press. Jackie Estrada is a co-publisher for Exhibit A Press as well as being a book editor and convention organizer. She is also the administrator for the Will Eisner Comic Industry Awards show that takes place at the San Diego Comic Con International every year. Both Jackie and Batton were close, personal friends of Will Eisner's and they have been kind enough to sit down with us for a bit to tell us about the man behind so many incredible comic book works. Unfortunately, we did experience a little bit of technical difficulty getting the episode recorded, so there is a bit of static on occasion, but please bear with it. The episode is great and is very informative. All fans of comics should learn more about Mr. Will Eisner, and this is a great way to start. One of the books that Jackie refers to is Eisner/Miller, a published discussion between Will Eisner and Frank Miller about various topics including the history of the graphic novel, the business of comics publishing and the relationship between comics and film. As promised, here's episode 14 of the show. This version was actually recorded properly and as such the sound quality of the program is much better than the last episode. Again, I'm really sorry about that. The next time you see me in public anywhere, feel free to punch me if you want to. All I ask is that you refrain from hitting me in the face. Anyhoo, on to the new episode. In this show, we get involved in a long debate over whether the firing of Jeph Loeb and Jesse Alexander from Heroes is a good or bad thing. As you'll soon learn from listening to the podcast, I'm all for them getting the ax. In fact, I don't think NBC went far enough. I want to see Tim Kring get fired too. The rest of the panel though doesn't really share this belief with me, hence the lengthy debate. Speaking of Tim Kring, here's a link to an article which features the quote of his that I read during the show (so you know I'm not making this up). Also, since we recorded the show, Kring has publicly apologized for the statement saying that wasn't what me meant when he said it and he would never insult the fans like that and yadda yadda yadda. Whatever. Frak that guy! Until next time folks! As always, I remain your most gracious and humble servant. Think of me like Alfred the Butler, minus the english accent and the severe old age of course. We members of the GeekRoundTable broadcast from a secret lunar base hidden deep under the surface of the Moon. We call it Moon Base Alpha Beta. It is our hidden Fortress Of Geekitude. Anyways, during the recording of this podcast there were several large solar flares that interfered with our recording equipment. Also, the laptop we record to wasn't properly plugged in to the recording hardware, but we think this only contributed to the bad recording quality to a very small degree. It was totally the fault of solar flares. Regardless, as the newly appointed recorder of the podcast, I take full responsibility for the poorness of this podcast. It is on my head that the blame should fall. We had considered scrapping the podcast entirely, but there are some moments on here that are truly worth listening to which simply would not have been able to be repeated. Therefore, the decision was made to try to clean up the podcast as much as possible and to give it to you anyways. I hope that some of you at least will make the effort to give it a listen. On the plus side, the technical errors were fixed for the second podcast we recorded on this day, and that will be posted here on the site very soon for your listening pleasure. I can guarantee you that the recording quality of that show will be back to its former glory. So hold tight true believers, we will have more for you soon.